Long protruding tongue used to feed. The third finger is more than 105 mm long. Snout is elongated and has a prominent nose leaf on the tip. The back is pale brown and gray. Although many misconceptions still exist regarding bats they are known to fly in large groups. These animals also roost in colonies, usually in caves or other sheltered places, like mine shafts, hollow trees or even the attics of homes. Once attached to the ceiling of a building or even parking garage they expel massive quantities of guano (bat excrement) which piles on the ground below. This cultivates large quantities of bacteria, bugs and maggots. This is dangerous for the bat for if it falls to the ground it is usually eaten alive by maggots or other animals. Furthermore, this buildup of guano is dangerous for humans since it releases ammonia which eats away at human lung lining. They are not aggressive animals that attack humans as many people believe. 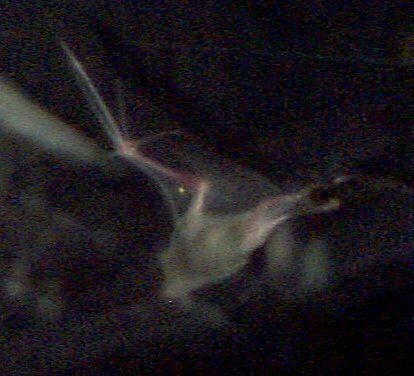 Mexican long-nosed bats are very useful as pollinators for agave growers and farmers alike. Agave is used for the production of mescal, and agave bootleggers represent a serious threat to the animal. Agriculture has also displaced agave habitat. Commercial agave farmers now leave some unharvested rows of plants for the bats. Their migratory patterns encompass areas of northern Mexico, Texas, Arizona, and New Mexico. They stay in their habitat during the hot and bright day and when the sun goes down they fly out to find their food. Because of its migratory habit, little is known about foraging, roosting and reproduction in this species. Although there is no external visible tail, three vertebrae compose what is known as the tail-- even though not very visible. One way to tell this bat apart from others is a small elongated piece on the nose of the bat. 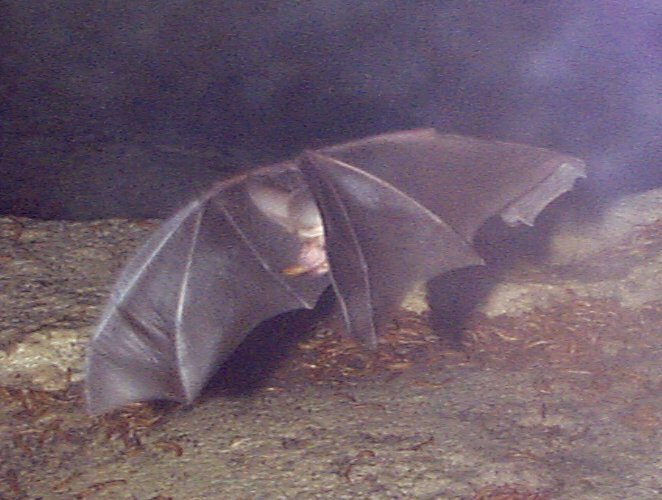 This triangular nose leaf on the tip of the nose gives the bat its name. These bats also have a long protruding tongue that assists in consuming nectar from plants like the agave. The relationship with the agave is mutualistic: the bat is pollinator for the plant, which in turn provides the bat with nectar and pollen. The bat's migration pattern appears to follow the seasonal bloom of the agave. The association between the two species is so close that the loss of either could lead to the loss of both. Comments about the Long-nosed Bats of the Fort Worth Zoo's Texas Wild exhibit. Bat Exhibit at the Fort Worth Zoo The area in which the bats are housed was constructed to resemble an abandoned mine shaft where bats might roost. Furthermore, the area was very dark and cool. The ceiling appeared to have little protrusions for the bats to hang from, and an recessed area where the bats can hide. 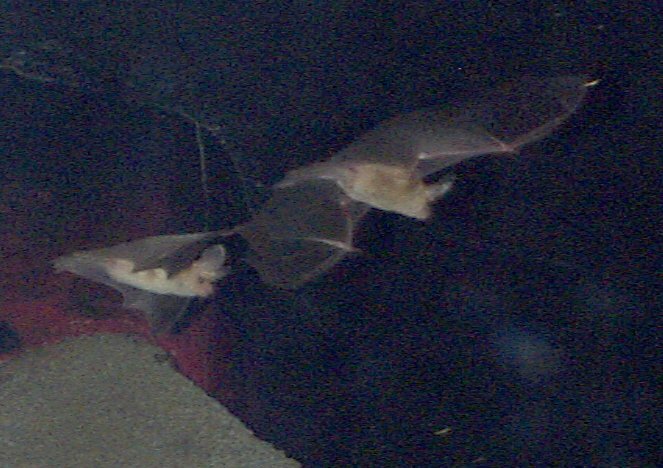 Periodically the bats fly out and appear briefly as they pass in and out of the dimly lighted areas of the exhibit.